The midfielder, who has won a wheelbarrow full of trophies at Inter Milan over the last decade, has signed a one year deal bringing him to the King Power Stadium. Welcome to Leicester Esteban. We are a little bit excited. Nigel Pearson made eight changes to the side that lost at Chelsea, with debuts handed to Hamer, Cain, Watson and Pearson, while Wasilewski, Taylor-Fletcher and Wood all started for the first time this season. Things appeared to be going to script in the opening minute when Mahrez burst in on the right, but Shrews keeper Leutwiler blocked his low shot. But the League 2 side then went on the attack: Hamer saving from a Collins header, and a cross/shot from Clark hitting the woodwork. City were struggling to create anything, Wasilewski getting his head to a Mahrez cross, saved by Leutwiler, was a rare chance. Then Knockaert’s free-kick was headed beyond the keeper’s grasp by Wood, but his effort hit the bar. Eight minutes before the break Shrewsbury deservedly took the lead against their Premier League opponents. After a foul on Woods 22 yards out, Mangan fired home the free-kick, beating Hamer low to his right. He appeared to injure himself in the process of scoring and had to go off. It really should have been 2-0 at the break as Demetriou side-footed wide when well-placed eight yards out. City’s fairly abject performance didn’t improve after the break and on 57 minutes Pearson brought King and Nugent on for Watson and Cain. But it was still the visitors who were creating the better chances. In the 75th minute Collins fired a shot against the right hand post and then Vernon, following up, hit the same post a second later. At the other end a persistent run from Knockaert led to him setting up a chance for Nugent, but his shot hit the left hand post. City’s final chance to force the game into extra-time came when Konchesky’s long crossfield ball found the head of Wood, but his effort went wide and City stumbled out of the competition at the first hurdle. Obviously, the League Cup is not a priority for the club this season and Nigel Pearson didn’t want to risk his threadbare squad, but it was still an embarrassing exit to a spirited League 2 side. Leicester: Hamer, Pearson, Wasilewski, Moore, Konchesky, Mahrez (Schlupp 69), Cain (King 57), Watson (Nugent 57), Knockaert, Taylor-Fletcher, Wood. Subs: Morgan, Hopper, Barmby, Smith. Shrewsbury: Leutwiler, Goldson, Grandison, Knight-Percival, Gayle, Woods, Wesolowski, Demetriou, Collins (Robinson 85), Clark (Akpa Akpro 85), Mangan (Vernon 40). Subs: Wildig, Caton, Halstead, Smith. Referee: Simon Hooper. Attendance: 8,017. Nigel Pearson brought Hammond in for Drinkwater and Schlupp for Knockaert and, although this line-up could be described an understrength, City looked undaunted by this visit to the title favourites. The early chances went to the home side, Oscar had a shot blocked by Morgan, and then Cahill had two efforts blocked by red shirts that were giving their hosts very little breathing space. Schurrle then headed a Hazard cross over, before City broke upfield. Mahrez saw a fierce shot beaten away by Courtois and then Schlupp had an effort deflected wide. At the other end Costa had a curling shot blocked by Morgan, and City could be well pleased with their efforts as the half-time whistle heralded a goalless half. Mourinho had apparently given his side something of a ‘pep-talk’ at the break and they appeared to have moved up a gear. 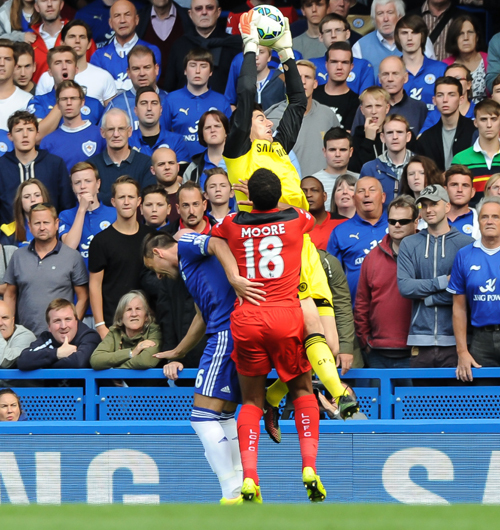 Oscar fired against the post, and then Ivanovic was denied by a superb Schmeichel save as City were stretched for the first time. But they should have taken the lead five minutes later when a speedy breakaway set up Nugent in a one-on-one with keeper Courtois, but the Belgian keeper managed to block with his legs. Schurrle then went close with a curler, before Schmeichel denied Ivanovic again this time tipping away a long-range shot. City were still looking dangerous on the break but Courtois again saved from Nugent after last year’s leading scorer had been set up by Mahrez. As play swung from one end of the field to the other Fabregas then forced another save from Schmeichel who tipped his attempted chip over the bar. However, Chelsea began to turn the screw further and City’s resistance was broken in the 62nd minute. 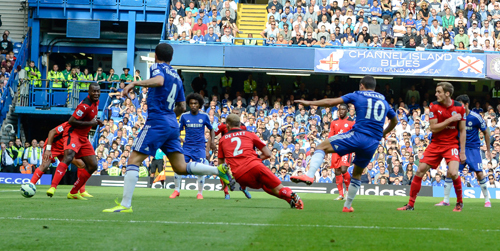 In a busy penalty area Costa guided home from close range after Ivanovic’s low cross made it across the goalmouth. City stuck to their task, and Pearson brought on Albrigthton and Taylor-Fletcher for Mahrez and Hammond, but Chelsea went further ahead in the 77th minute. Fabregas sending Hazard through for a run and shot beyond Schmeichel’s reach. 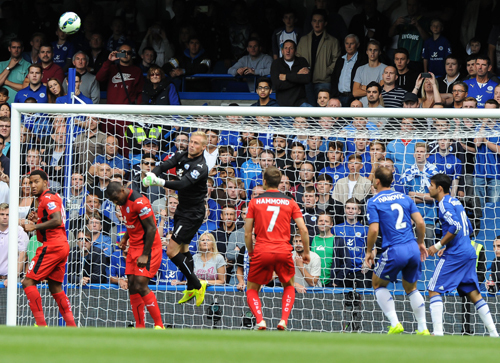 Schmeichel then made another fine save from Willian to keep the scoreline at respectable levels. It was a predictable enough defeat against Chelsea’s Megastars, but City fans could take great pride in their side’s performance, which boded very well for the rest of the season. Chelsea: Courtois, Ivanovic, Cahill, Terry, Azpilicueta, Matic, Fabregas, Schurrle (Ramires 64), Oscar (Willian 70), Hazard, Costa (Drogba 79). Subs: Cech, Zouma, Luis, Mikel. Leicester: Schmeichel, De Laet, Morgan, Moore, Konchesky, Mahrez (Albrighton 68), Hammond (Taylor-Fletcher 72), King, Schlupp, Nugent, Ulloa (Wood 84) Subs: Hamer, Hopper, Knockaert, Wasilewski. Referee: Lee Mason. ATTENDANCE: 41,604. L’Equipe is reporting that representatives of Marseille defender Rod Fanni have been unable to agree personal terms with Leicester City. The 32 year old French international’s wage demands did not fit in with City’s wage structure and the deal now appears to be dead. A shame for people who like a good innuendo in their headlines, but there you go. One signing that has been completed is that of Jamie Vardy who has signed a new four-year deal with the club. We have received a few shop returns of The FOX fanzine ‘Champions Specials’, back from the shops. Very limited availability, but you can make sure you get your copy by clicking on the cover below and paying just £3 online via Paypal… this includes Post & Packing. James joined Vardy, Albrighton and Upton on the injury list with City starting with a side the same as last season’s but for debutant Ulloa. In a cagey opening spell to the game City looked a little nervous and gave possession away too easily. On one occasion this led to Baines delivering a pinpoint crossfield ball to the lively McGeady on the right, but Konchesky blocked his attempt on goal. However, City looked determined to press forward and Morgan placed a shot narrowly wide when presented with a decent opportunity in the 17th minute. Soon after that Ulloa almost robbed Howard of the ball on the edge of the area but couldn’t quite get it under control. Instead it was the visitors who took a 20th minute lead. Schmeichel managed to block Distin’s shot, but couldn’t stop McGeady finding the top right hand corner with a superbly accurate effort that eluded several blue shirts guarding the goal. But the Premier League new boys didn’t let their heads drop and, roared on by a sell-out crowd, they were on level terms within two minutes. From a King corner an attempted clearance struck Ulloa, and the Argentinian reacted swiftly to prod the ball home for a debut goal. Knockaert then went close with a 35 yarder, but Everton then gradually took control of the game for the rest of the half. Things worsened for City when Drinkwater limped out of the action five minute before the break, replaced by Hammond. City needed to get to half-time without conceding to regroup, but that didn’t happen as Naismith, set up by Pienaar, topped a clever run with a fine finish, in off the crossbar, a minute before the break. Although the atmosphere felt a bit flat among supporters at half-time, the players rallied themselves and produced a second half to be proud of. In the 54th minute Mahrez produced a great cross but Ulloa directed his header well wide. Schlupp then replaced Knockaert and should have equalised with his first touch, when strong running saw him bearing down on goal with only Howard to beat, but he blazed his effort well over the bar. 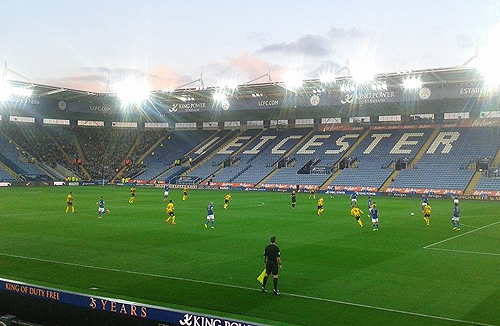 Mahrez went close with a free-kick after being fouled on the edge of the area by McCarthy. Wood then replaced Ulloa with 12 minutes to go and won a few headers in areas where Everton had dominated. It looked as though City were running out of time with four minutes left on the clock, but then Wood seized on a loose ball after Jagielka had blocked a King effort, and he beat Howard with a precise first time shot to raise the KPS roof. There were hearts in mouths in time-added-on when Lukaku sent a header over, but it was a rare chance for the £28M pound man who had spent the afternoon in Morgan’s pocket. It was a hugely important point for City, who had proved that they could live at this level, even without the James/Drinkwater midfield engine room. Leicester: Schmeichel, De Laet, Morgan, Moore, Konchesky, Mahrez, Drinkwater (Hammond 39), King, Knockaert (Schlupp 64), Ulloa (Wood 78), Nugent. Subs: Hamer, Hopper, Taylor-Fletcher, Wasilewski. Everton: Howard, Stones, Jagielka, Distin, Baines, McGeady (Coleman 84), Barry, McCarthy, Pienaar (Mirallas 81), Naismith, Lukaku. Subs: Robles, Besic, Atsu, Osman, Alzaraz. Ref: Mike Jones. Attendance: 31,603.